The Marotta gone-fishing portfolio is used by many subscribers as a free and simple way of low-cost investing. Last year’s returns were very well diversified and did very well. I made only one change in this year’s gone fishing portfolio recommendation. If you were already invested according to last year’s asset allocation you can change with a simple buy and sell. I removed the allocation to Vanguard Information Technology ETF (VGT) and replaced it with an allocation to Vanguard Mid Cap Value ETF (VOE). Vanguard Information Technology ETF (VGT) had a 25.35% return last year (actually the analysis was for the twelve months of 11/30/2013 through 11/30/2014). These were the highest returns in the portfolio. I considered replacing it with Vanguard HealthCare mutual fund (VGHCX/VGHAX) because healthcare generally does better in a down market than technology. But there were two reasons I decided not to. VGHAX has a return over the past twelve months of 32.06%. Moving out of technology at least partly because it is up so much means we shouldn’t be moving into something which is up even more. And second, VGHAX has account minimums and transaction costs at many custodians. 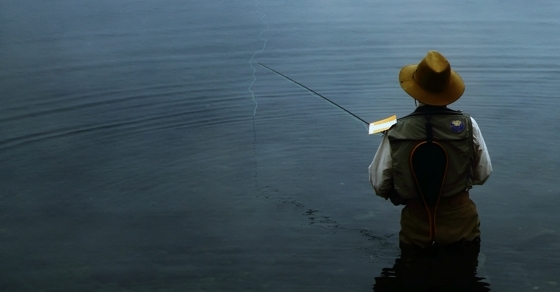 It is better to keep the gone fishing portfolio comprised of investments that everyone can easily buy. In the end I decided to replace VGT with Vanguard Mid-Cap Value ETF (VOE) which was “only” up 17.87% over the past twelve months. Using VOO, VOE, and VBR we can create an style box asset allocation which is very close to our ideal allocation for US stocks. In 2014’s changes we added the ability to select an asset allocation either by age or by setting the allocation you want to stocks and having the remainder allocated to bonds. This provides more flexibility for using the calculator. Last year we also dropped the allocation to money market (cash). If you don’t know how much to put into cash or bonds, learn how having a plan not to run out of money is priceless. Check out how last year’s allocation fared over 2014 and use this year’s calculator to plan for 2015. Photo by Agustin Rafael Reyes used here under Flickr Creative Commons.